In its latest announcement, Arby's is putting deer back on the menu. Its first release of a venison sandwich was last October, but it was limited to "five select hunting-centric states" where stores sold out within hours. This time, the sandwich will again be short-lived but will be available nationwide. That makes Arby's the first fast-food chain in the US to offer venison at a national level. Venison sandwich hunters need only stop by an Arby's on October 21 for the opportunity to lay their calloused mitts on the latest addition to the meat mountain. The sandwich features a thick-cut venison steak marinated in garlic and topped crispy onions. The whole ordeal is finished with a Cabernet steak sauce infused with juniper berries. The venison sandwich cost $7. Supplies will be limited, so it may sell out quickly once again. The chain couldn't get enough deer from the US since it's not regularly consumed on such a large scale. It had to turn to a New Zealand source to provide enough grass-fed, free-range deer. Arby’s Chief Marketing Officer Jim Taylor told WHAS it took a full year to secure enough product for what he believes is the "biggest venison promotion in the world any restaurant" has ever put together. Additionally, that same day, the roast beef chain will debut an Elk Sandwich. Like with the first run of venison, the elk sandwich will be available in "hunting-centric states." One restaurant in each of Colorado, Wyoming, and Montana will get the sandwich. 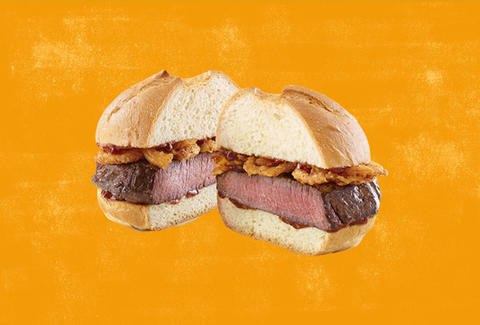 Did someone question whether Arby's has the meats? It feels a bit like its trying to prove a point about whether or not it has the meats.